Ice? Nice. Frozen fruit’s a real refresher, too. Your ideas? Keeping a well-stocked freezer is an imperative this week, and having recently cleaned out ours, I’m here to prove it’s now stocked with the bare necessities. Miller time? 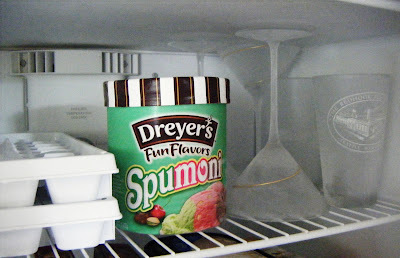 Not yet, but that spumoni’s looking pretty good right about now. My friends, however, are apparently concerned about the state of my near-empty freezer, and feel it’s their duty to do something about it. My pal Missy (“Melissa A. Trainer” to those who know her by-line and her blog, Hooks for Cooks) shot me an e-mail this morning suggesting I might want to take her advice and hook up with a refresher that requires no cooking — if you don’t count the simple process of making simple syrup: fresh fruit popsicles. Great idea! And as it happens, I’ve got a quart of blueberries waiting for some attention, so maybe I’ll tweak that recipe and give it a go later today. If I can summon up the energy. Moments after reading Missy’s missive, my friend Mr. Liu dropped by with a bag in hand. “Ever eaten a frozen lychee?” he asked. Nope, I told him: that’s an ancient Chinese secret I’ve heretofore missed out on. Lychee sorbet, I’ve eaten. Ditto for frozen grapes. 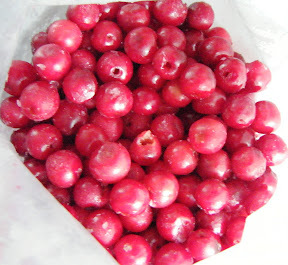 And frozen Montmorency cherries (there are plenty of those bagged up in my basement deep-freeze, awaiting cooler weather when they’ll be baked into pies). 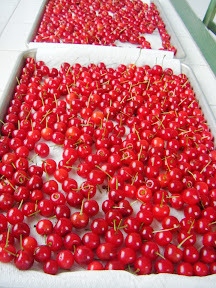 Montmorency cherries, fresh and frozen, harvested from our backyard last month. 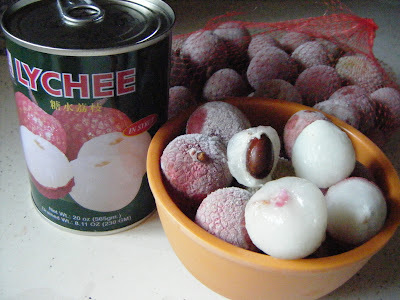 Until today I’ve never appreciated the joy of biting into a frozen lychee — a fruit whose sweet perfume has held a special allure for me since way-back-when: When I first tasted the canned version served with roast duck at the Dragon House in Wildwood, N.J. Delicious, but peeling the frozen ones isn’t too easy. Maybe I’ll freeze that can! These days, I always keep a can around just in case my sweet tooth gets the better of me and there’s no spumoni on hand, though I’ve long since become a huge fan of the fresh product. You won’t find fresh lychees at our local farmers markets, but like the plethora of Northwest berries and cherries available right now, they’re also in season — and available at Asian markets all around town. And while we’re on the subject, anybody have any other ideas regarding refreshing frozen-fruit treats? Feel free to share. My other friends did.